Movement and exercise is SO important for all kids! The CDC recommends that kids get 60 minutes of aerobic activity every day. Sadly, the US Department of Health states that only 1 out of 3 children are physically active each day. Since kids spend so much time at home and school sitting, I decided to do something to increase the movement of the kiddos in my classroom. This year we started implementing a 20 minute gross motor group every single day. It's a great time for students to get energy out, to create healthy habits and to give students with wheelchairs more opportunities for position changes and opportunities to use PT equipment. I want to share some of my favorite ideas for implementing a gross motor/ exercise group in my special education classroom. My kiddos love when there's an element of surprise during gross motor! We love to use spinners, dice and number sticks to determine how many of reps of each exercise we will do. We also use them to tell us the page or activity number to go to. For example, we might set a spinner with the numbers 1-30 and then use the spinner to tell us what page in an exercise book to go to. I also love to tie counting, number identification, color identification, and communication into gross motor activities. This student was touching the "turn" picture card to request a turn. 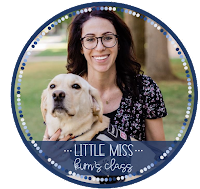 -Have students with AAC devices or who use PECs complete sentences to communicate what they want to do or request for gross motor supplies. 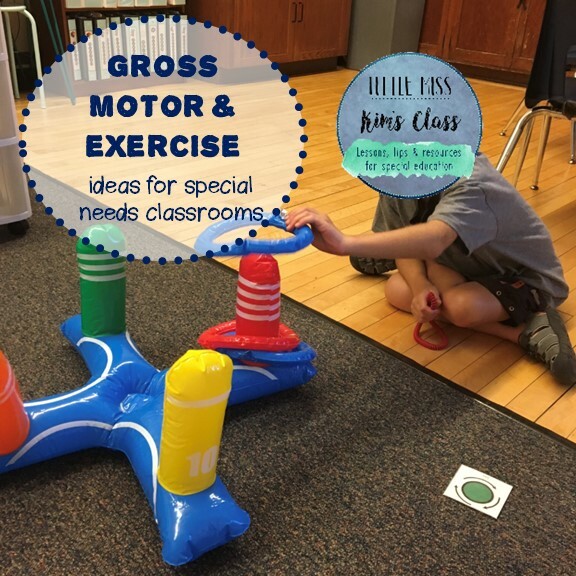 -Here's a video example of how I encourage kiddos to communicate and identify colors during gross motor. We normally start every gross motor group by doing a few yoga breaths and moves together. If the gross motor group got students really energized/ riled up, we will also end the gross motor group with a calming breath. We use a variety of resources when we do yoga, including Youtube videos (I normally just search "yoga for kids"), the below Breathe With Me book, and free yoga cards from TpT. Our favorites are these free yoga cards from The Teacher's Passport and these arctic animal yoga pose cards from Megan's Creative Classroom. This is my all time FAVORITE yoga book for kids. My dear friend and colleague wrote this book. It has a ton of different breaths with picture explanations. It's also translated in Spanish! You can buy it from Amazon here. Games aren't just for working on gross motor skills, they're also great for working on communication and social skills like turn taking, waiting patiently, etc. I like to use cheap games like ring toss and bowling that you can buy from the Dollar Tree and Target. It's great to have a few of these games on hand in your classroom because they don't require much prep! My student teacher made this super cute skee ball game! This bowling game was only $5 from Target! The ability to imitate skills is super important for our kiddos because it allows them to start learning from others around them. Gross motor/ exercise is a great opportunity to teach our kiddos to imitate motor actions like jumping, touching body parts, clapping, etc. 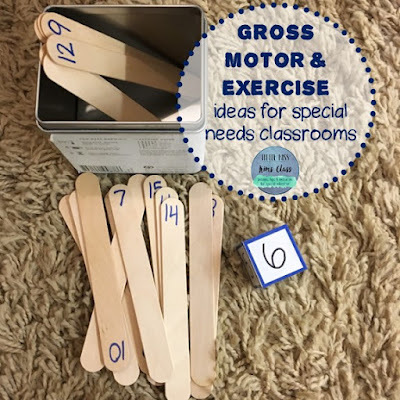 You can snag these gross motor cards for free here. 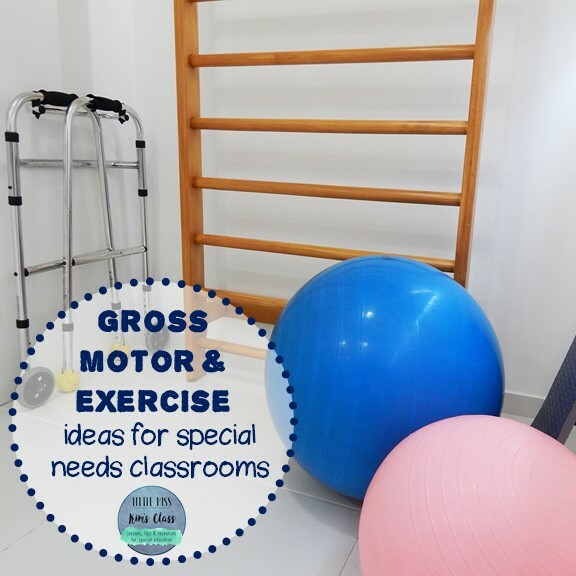 Do you have any favorite gross motor/ exercise activities you do in your classroom? Leave your ideas in the comments! Really thankful for the post as we have just started these classes and needed ideas for the school to make the children more interested in these activities.